Intel has announced the Lenovo K800 is to be the first smartphone featuring an Atom processor. It's a 4-inch Android smartphone powered by the Intel Atom Z2460 'Medfield' platform. The Lenovo K800 features an 8 megapixel camera, and has Intel's Wi-Di technology built in, so you can connect the handset wirelessly to external displays. Lenovo announced the news during Intel CEO Paul Otellini's keynote here at CES 2012. Intel has been talking the smartphone talk for what feels like a long time with no design wins to speak of. But it seems things have changed. And it's not just Lenovo that has stuck its neck out from the ARM crowd. Intel and Motorola also announced the two companies were entering into a "multi-year, multi-device relationship" including Moto smartphones featuring Atom running Android. There were no details on the exact nature of any devices from Motorola, but TechRadar understands that the line-up will include a new smartphone and a tablet, and that details will most likely be revealed at Mobile World Congress. The handsets will feature the Atom processor Z2460 platform, formerly known as Medfield. The platform was specifically designed for smartphones and tablets. "We are delighted to be partnering with Intel to deliver smartphones and tablets based on Intel's Atom processor to consumers and businesses," said Sanjay Jha, CEO of Motorola Mobility. "Though there are 5 billion mobile subscribers in the world, less than 800 million are using a smartphone today. With Android as the leading smartphone OS globally and advancements in computing technology we see tremendous opportunity for the converged devices market." Intel says that "several smartphones" based on the new Atom processor are expected to come to market in 2012. "The best of Intel computing is coming to smartphones," said Intel President and CEO Paul Otellini. "Our efforts with Lenovo and Motorola Mobility will help to establish Intel processors in smartphones and provide a solid foundation from which to build in 2012 and into the future." Otellini added that enabling the "best mobile experience" is a priority for Intel. While Lenovo's partnership with Intel is understandable given the companies' heritage of designing laptops together, the Motorola collaboration is a real surprise. The partnership with Lenovo is certainly a union of two technology giants that have yet to make an impression in the mobile sphere. If the handset is a success, it could persuade more manufacturers to build Atom based smartphones. There's no doubt this is a big day for Intel's ambitions in the smartphone market, but we doubt ARM is quaking in its boots. We're meeting with ARM tomorrow, so we'll let you know what it thinks of Intel's announcement. 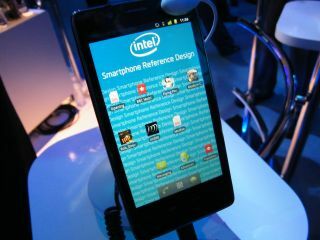 Intel also demonstrated a referencedesign for smartphonesto speed up development time of Intel Atom-based handsets.